The Satellite C850-1C0 is the latest 15.6" notebook from Toshiba's laptop range, priced around the £350.00 mark and providing the Intel Celeron B830 1.8GHz processor with 4GB DDR3 RAM and a substantial 640GB hard drive loaded with Windows 8 operating system. Finished in a slight textured black exterior, which follows suit inside, it looks smart on first impressions. Read on for our Toshiba Satellite C850-1C0 review. 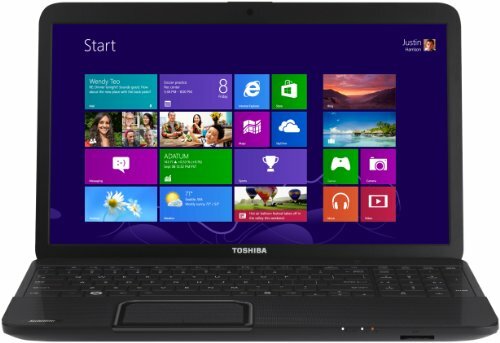 Below is our review of the Toshiba Satellite C850-1C0, a 15.6" laptop, featuring 4GB RAM, 640GB hard drive and Windows 8. Surrounded in a textured matte black finish, this laptop from Toshiba is the latest notebook in their ever expanding Satellite range. This particular model is firmly located in the low to mid end market place, offering a fairly competitive specification for it's retail price of approximately £350. Inside you'll find the Intel Celeron B830 processor which is typically found in lower end laptops. The B830 is a dual core processor, featuring an integrated graphics card in the form of the Intel HD graphics, and is based upon the Sandy Bridge architecture. Backing this up is 4GB of RAM, which can be upgraded to a maximum of 8GB, as well as a surprisingly generous amount of storage with the built in 640GB hard drive, operating at a speed of 5400rpm. The majority of laptops in this price range tend to include a 500GB drive, and so this extra 140GB is a welcome feature. As per most notebooks in the Toshiba range, it features a 15.6" screen which in the 16:9 format has a default resolution of 1366 pixels by 768 pixels. During the test period our users for the most part were positive about the display, with it's crisp picture and rich colours. In terms of connections Toshiba have provided a DVD drive, Ethernet, 2 x USB 2.0, 1 x USB 3.0, headphone, microphone, HDMI and VGA, as well as a multi card reader catering for SD and mini SD / micro SD as well. The keyboard reaches across the width of this notebook, providing a comfortable typing experience. Situated on the right hand side is a number pad, which is a nice touch and will appease those who require numerical input on a regular basis. The touch pad is surrounded by the same textured black finish, and is located to the left side of the interior. As per the rest of Toshiba's range, this aspect of the notebook was easy to use, offering accurate control over proceedings. No complaints here. It measures a total of 38.0cm by 24.2cm by 3.35 cm, and weighs around 2.3kg, which is slightly lighter than average, and as such makes this notebook ideal for those who need to commute or travel regularly. So overall what did we make of this notebook? Looks smart and performs well. 640GB of storage space is quite generous for notebooks in this price range. The black textured finish divided opinion. If you're looking for a functional and practical yet fairly inexpensive laptop, then you could do a lot worse than purchase the Toshiba Satellite C850-1C0.